An instrument that ANYONE can play. No musical experience needed. Simply slide one of the music cards under the strings and pluck the string over each note on the card. There are 3 models: standard, deluxe and custom. Models are shown below. They all have at least 2 octaves in the key of G. All models are built with the same high standards and use US made zither pins, hard maple for the pin blocks, and 3 different diameter wire for optimal sound. 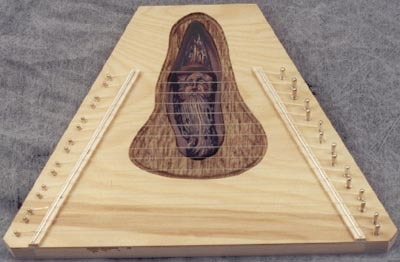 Accessories for the standard and deluxe lap harps include 19 music packs, an advanced playing information pack, blank song sheets pack , a display stand, carrying cases, a gooseneck tuning or T handle wrench, string replacement set, electronic tuner, tuner pickup, and a mini amp for sound amplification. 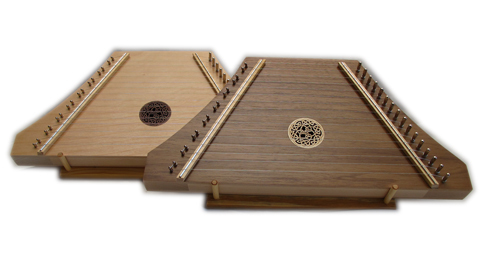 All the 19 regular music packs can be played on any lap harp but the custom lap harp music packs are designed only for use on the custom lap harp. All Standard models come boxed with pick, flat tuning wrench, spare wire, set of starter music (12 songs) with tuning and wire replacement instructions. Deluxe models come boxed with pick, flat tuning wrench, spare wire, set of starter music (12 songs) with tuning and wire replacement instructions. LH-WC Walnut top Lap Harp Package. 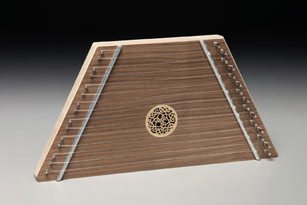 The custom lap harp is different from the standard and deluxe models in that the music cards are written to show some harmony notes as well as the melody notes. The harmony notes are shown in gray to set them apart from the melody. The two octave range is extended by one additional note at the bottom of the harp. Our Celtic Knot rosette accents the soundhole. It comes as a package with its own carrying case, gooseneck tuning wrench, pick, string replacement set and starter set of music. Currently there are 3 packs of music written just for this model: Christmas, Hymns and Folk. Each pack has 18 tunes with harmony as well as melody notes shown.